Rusangano Family beat off some tough competition to scoop the award last night. 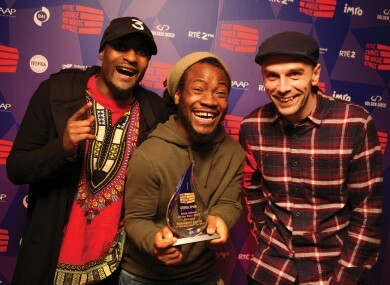 LIMERICK AND SHANNON-based hip hop group Rusangano Family faced down some tough competition to win the RTÉ Choice Music Prize last night. The African-Irish trio faced down more experienced groups and singers to secure the prize for Irish Album of the Year for their 2016 record Let the Dead Bury the Dead. The trio – God Knows, Murli, and John Lillis – are based in Limerick and Shannon in Clare. They secured the prize ahead of more established bands and artists like The Divine Comedy, James Vincent McMorrow and Lisa Hannigan. Accepting the prize in front of a sold out crowd in Dublin’s Vicar Street last night, the group - who also teach music to children and young adults – thanked their students and everyone who helped them along the way. The award also comes with a €10,000 cash prize. The band came together originally as independent artists recording together, before officially forming Rusangano Family in 2015. They have been regulars on the Irish music scene in recent years, performing at high-profile music festivals and events as well holding their own stand alone concerts. God Knows and Murli are MCs while Lillis DJ’s, mixing tracks live on stage. The album Let the Dead Bury Dead explores themes of identity, the experience of being an immigrant, isolation as well as artistic expression and inspiration. Meanwhile, the Irish Song of the Year award was picked up last night by Athy duo Picture This for their song Take My Hand. Email “This hip hop trio made the best album in Ireland last year”. Feedback on “This hip hop trio made the best album in Ireland last year”.